(Bloomberg Opinion) -- Turkey's central bank has stepped out from the shadow of President Recep Tayyip Erdogan. Hopefully it can stay there. elevated levels of inflation and inflation expectations continue to pose risks on the pricing behavior...if needed, further monetary tightening will be delivered. Erdogan had put the central bank firmly behind the curve. Soaring inflation rates called for monetary tightening, but the president was minded to let it run, and this caused the currency to collapse. Finally, Erdogan seems to have been persuaded his hands-on approach is counter-productive. The central bank’s 500 basis points of rate increases in less than two months has allowed the lira to recover half of its losses. 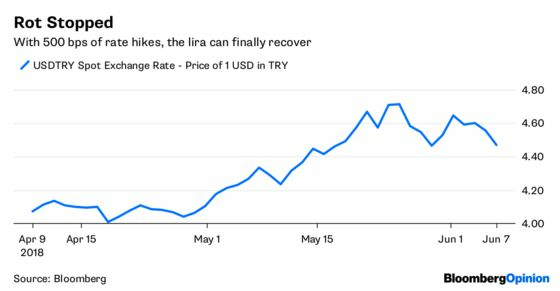 This shows how important it is for the central bank to be proactive -- a return of the lira to 4.90 or higher versus the dollar would be a disaster and require ever sterner rate hikes to recover control of the currency. 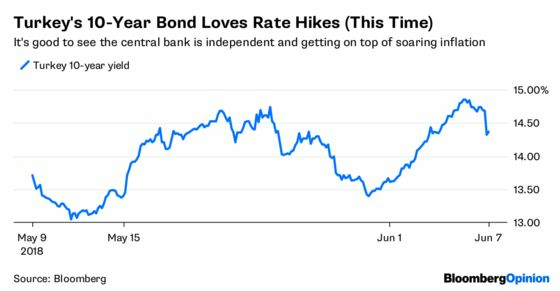 It is a lesson for other emerging market countries that are heavily reliant on dollar funding -- the Brazilian central bank, for one, should be taking heed. What happens after Erdogan's presumed victory at the upcoming presidential election is another matter. The first round is on June 24, and even if he fails to get 50 percent of the vote there he’s sure to sweep a second round on July 8. The point is that the increased powers he has secured for his office are going to be hard to resist playing with. That he claimed only last month that he sees it as his responsibility to control monetary policy is a very worrying sign. Though he has given the central bank the green light during the election campaign to get control of the currency, whether that persists afterwards is the burning question. Thursday's larger-than-expected rate hike is a small win, but the battle for the central bank's independence is far from over.